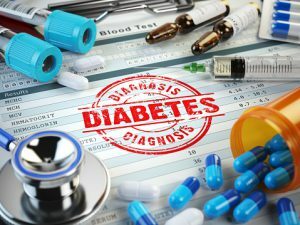 According to the most recent data from the American Diabetes Association, nearly 30 million Americans are living with diabetes, many of whom are undiagnosed. Diabetes is a serious condition that if not managed properly can lead to a variety of health problems and it is the seventh leading cause of death in the United States. For many diabetics, living with the disease means juggling medical appointments with various specialists to help them manage their condition. To help those living with diabetes in our community properly maintain their health, Jamaica Hospital has coordinated many services under one roof. The hospital’s MediSys Family Care Center in St Albans recently added ophthalmology, podiatry, and nutritional counseling to its list of services and a schedule was created so that each service would be available on the same day, allowing patients to easily go from one appointment to the next without leaving the building. Diabetes can lead to a variety of vision problems. One of the most common diabetic-related eye disorders is glaucoma. People with diabetes are 40% more likely to suffer from glaucoma than people without diabetes. In addition, diabetics are 60% more likely to develop cataracts. If left untreated, these issues can become serious and can even lead to blindness. Uncontrolled diabetes can damage the nerves in your extremities, especially in your feet. This lack of feeling is called sensory diabetic neuropathy. Diabetes also affects the flow of blood. Without good blood flow, it takes longer for a sore or cut to heal. If you have an infection that will not heal because of poor blood flow, you are at risk for developing ulcers or gangrene. For people with diabetes common foot problems can possibly lead to infection and serious complications, including amputation. Healthy eating habits can help keep blood glucose, also called blood sugar, within target range. A nutritionist can help diabetics by teaching them what to eat, how much to eat, and when to eat. For those with diabetes, a proper diet can improve their overall health and reduce the risk of heart disease, stroke and other conditions caused by diabetes. For more information about the full range of diabetes services at Jamaica Hospital’s MediSys St Albans Family Care Center, including hours of operation, please call 718-206-9888. All content of this newsletter is intended for general information purposes only and is not intended or implied to be a substitute for professional medical advice, diagnosis or treatment. Please consult a medical professional before adopting any of the suggestions on this page. You must never disregard professional medical advice or delay seeking medical treatment based upon any content of this newsletter. PROMPTLY CONSULT YOUR PHYSICIAN OR CALL 911 IF YOU BELIEVE YOU HAVE A MEDICAL EMERGENCY. Are You At Risk for Asthma? What is a hernia ?